I like the way Takashi-san thinks. 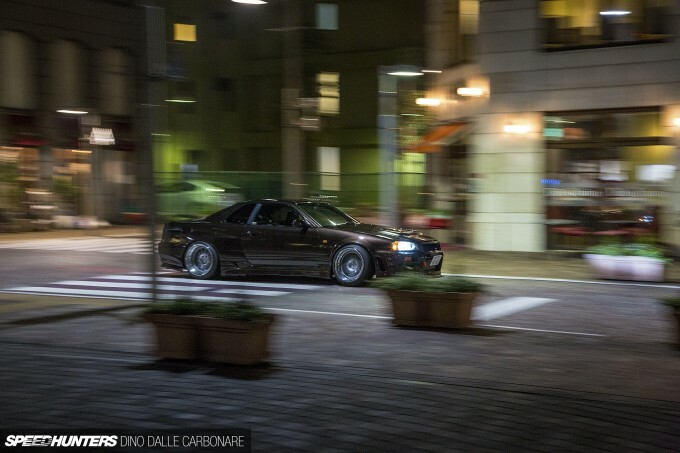 When I saw his car pop up on Instagram a few weeks back I instantly thought to myself, ‘damn – now that looks as fresh.’ Despite the fact that ER34 Skyline GT-ts aren’t a very popular drift platform in Japan, it was doing a lot of things right when it came to style. After a quick hunt around on Facebook, Takashi-san and I were chatting within minutes and discovering that we live surprisingly close to one another in the metropolis that is Tokyo. A few days later we met up after work at a little spot I know. I arrived at the location ahead of schedule and took the opportunity to grab a rather late dinner courtesy of the surprisingly healthy offerings one can find at Natural Lawson. As I gobbed down my last bite of a tasty prawn veggie wrap, I heard the familiar burble of an RB engine reverberating off the tall buildings that make up this extremely un-Japanese slice of Shimbashi. 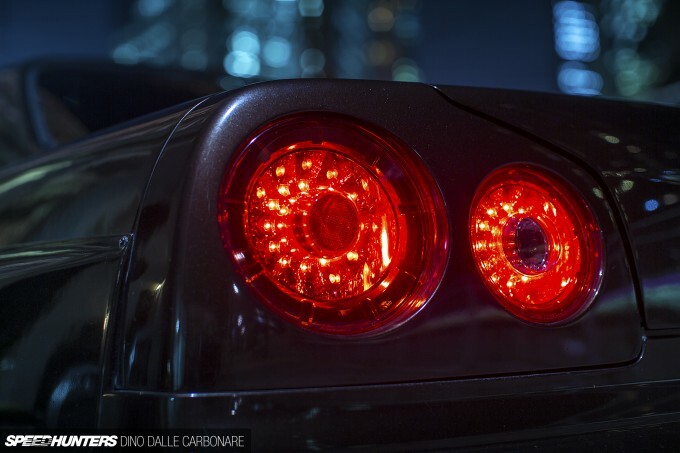 I was instantly happy, as the few images I had seen of Takashi’s Skyline online in no way represented how damn cool it looked in person. Sitting down on the cold cobble stones setting up my tripod, the ER34 just popped against the background I had chosen, the street lights playing around with deep Porsche Macadamia Metallic hue. Providing you can find a quiet enough area where there aren’t cars continuously driving through, Tokyo at night can serve up some stunning backdrops. But my biggest enemies when I’m out doing evening shoots in the city are security guards of the senior citizen variety. Dressed in their blue uniforms and overly eager to wave around their red LED illuminated batons, these guys will go out of their way to kindly tell you to move on. But there was no such nonsense this particular night and everything was spot on – the subject, the location, the weather and even the light. For once I could finally take my time and concentrate on the car and its details, which start up front with that Eurou bumper. 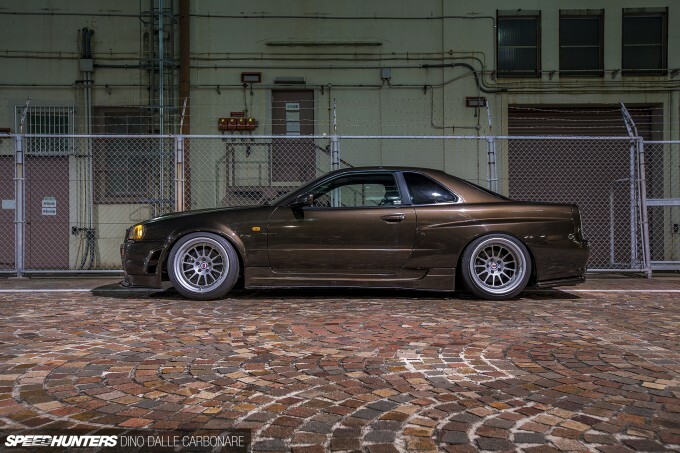 There’s no hiding the fact that its design is inspired from the Nismo Ver.1 and Nismo Z-tune bumpers for the BNR34, but seeing as this GT-t is built for drifting, and that Takashi takes out on track every opportunity he gets, running an expensive Nismo item was not an option. The ER34’s chin is further enhanced by a New Type diffuser which adds a touch of class through its glossy carbon fibre weave. Wheel fitment was important, and as far at Takashi was concerned they had to position perfectly with the New Type front wider fenders, which help give a GT-R-esque look to the rather narrow ER34 body. The fenders are 50mm wider than stock on each side so have no problem swallowing up the increased track brought upon by the HREs. 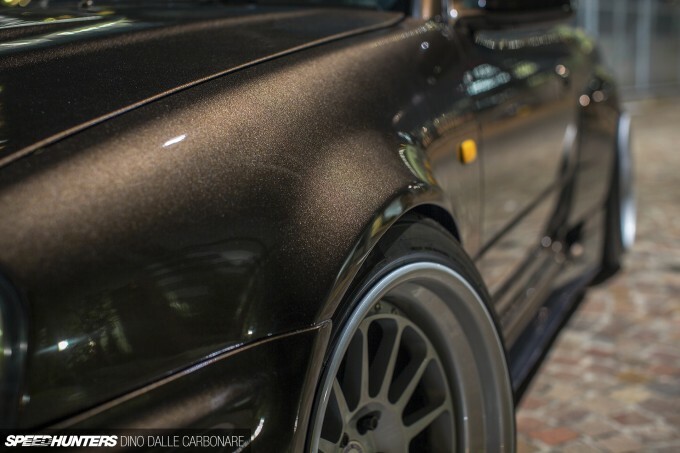 With this image in particular you can really get a sense of how deep and sparkly the Porsche-derived paint really is. I have seen a few 911s finished in this rare colour but it just works so much better on a car like this. 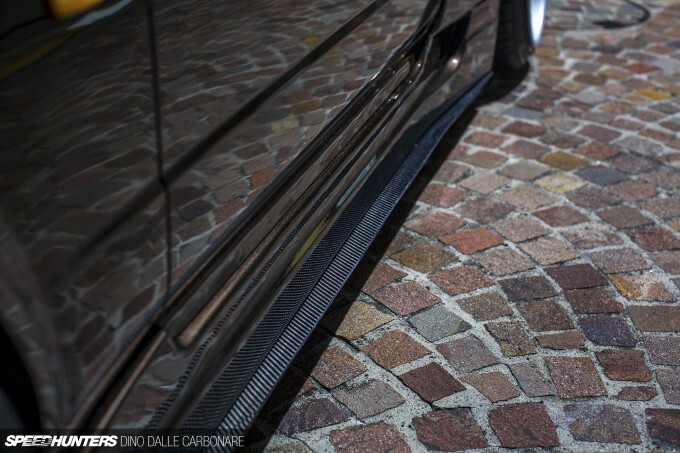 A set of Cross Factory side skirts were fitted but deemed not quite right on their own, which is why Takashi consulted the New Type catalogue again and selected some carbon fiber underskirts to help boost the car’s profile. Job done I’d say. The rear HREs are pretty aggressive in both size and fitment: 18×11.5-inch with stretched 245/40 rubber to get the look just right. And that look is tayazuri, which means the fenders run right up against the stretched sidewall – much like Bee Dragon do with their custom VIP cars and Nakai does with his more extreme 911 projects. There was no way the stock ER34 rear arches were going to cope with the sort of fitment that runs a -29 offset, so Takashi had someone go wild with a hacksaw to make the necessary space. Once everything was cleaned up Cross Factory fenders were attached, adding 60mm of width on each side. 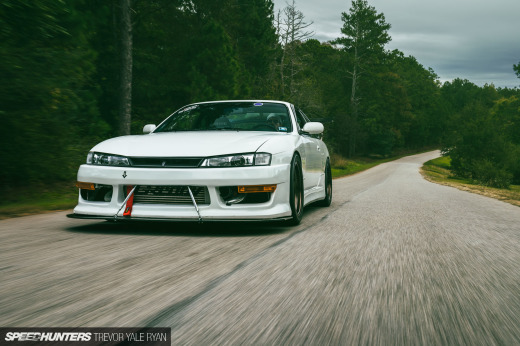 If an aggressive stance was what Takashi was after, he can definitely tick that off the list! It all makes for a GT-t the likes of which we have never come across before. 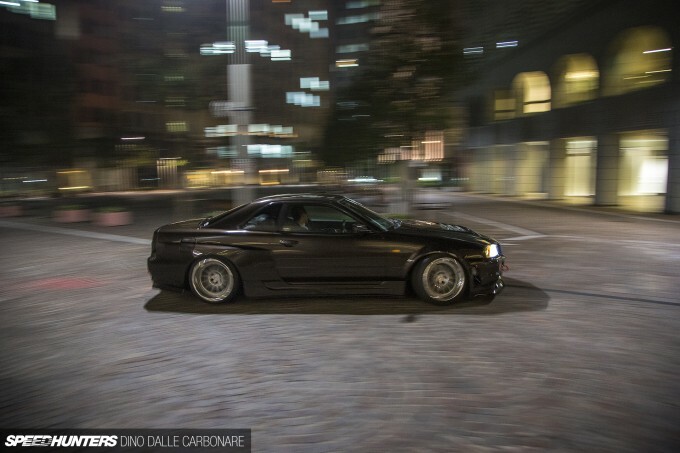 This is a drift car that doubles up as a mean street car, as well as a show car if need be. But it doesn’t end there, and out back you’ll find a BNR34 rear bumper finished off with a Uras rear diffuser and Nismo rear skirts, and a de-spoilered trunk lid. For a modern touch LED taillights have been fitted, and Takashi made up his own fog light using an LED strip borrowed from a Honda Fusion scooter of all things. The sum of all the styling modifications is impressive, but looks aren’t much without an adequate amount of power to back them up. 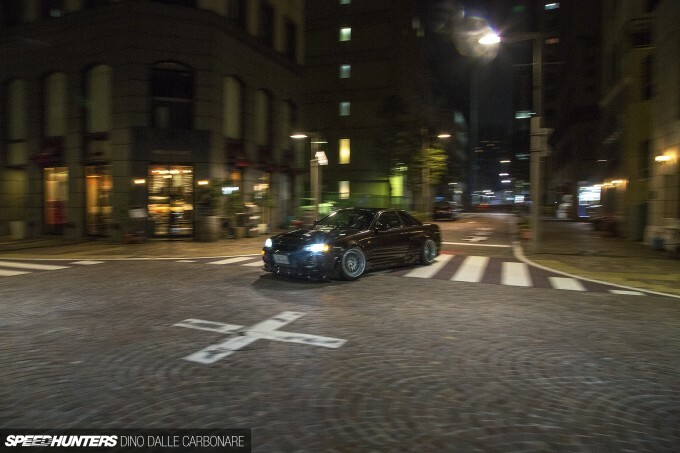 Seeing that Takashi drifts the ER34 regularly, a few select upgrades were required. I never quite got why Nissan decided to cover up the RB25 in the R34 in this way, as the RB26’s younger brother is a good-looking engine without the plastic shroud. 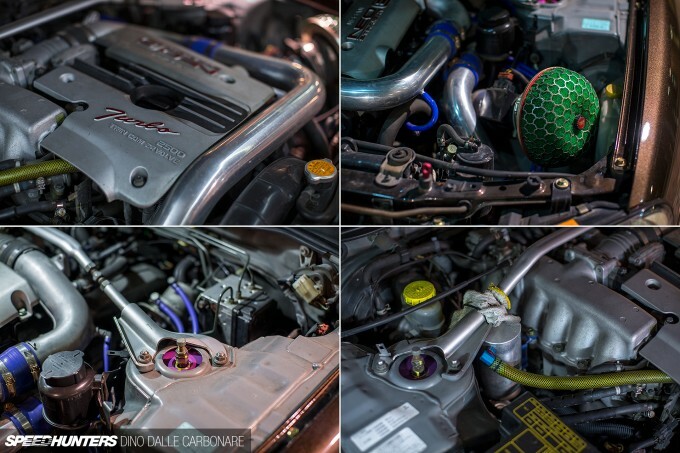 Takashi has kept things simple and functional, getting an extra dose of power and torque through the addition of a Trust TD05-18G tubocharger running higher boost and helping deliver a dyno-proven 358PS at the rear wheels. 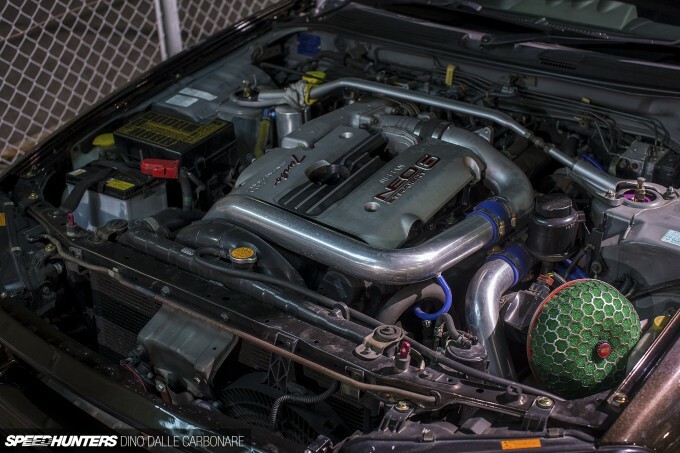 A Trust front-mount intercooler was added to ensure the intake charge is cooled efficiently, but due to the design of the stock plenum the piping is pretty long which impacts on throttle response – something Takashi plans to rectify in the future with a revised setup. A nice and burbly straight-through exhaust ensures there is little to no back pressure, which makes the best out of the entire setup. More fuel is supplied thanks to a larger capacity pump while everything is managed by a custom-mapped ROM chip in the stock ECU. A beefed-up driveline was also in order, and while the factory 5-speed gearbox was deemed up-to-task, the clutch and diff were replaced with aftermarket items – namely an HKS twin-plate and an ATS 2-way LSD. 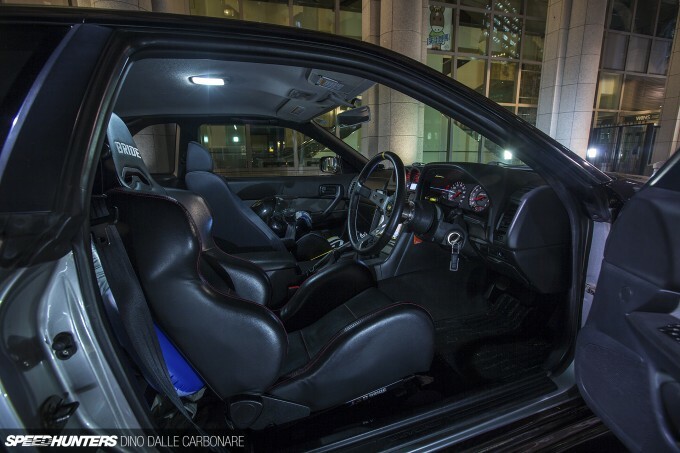 With all the performance details having been taken care of, there was one last area that needed attention – the interior. You see, Takashi is a family man and despite his little drifting hobby on the side, the ER34 actually doubles up as the family car. In that respect there was certain need to keep things relatively comfortable and only add what was necessary . First up the horrible late-’90s steering wheel just had to go! It’s been replaced by a deep-concave OMP item which fits the ambience and feel of the car rather well. Weekend road-tripping with the family or simply navigating through the labyrinth-like backstreets of some of the more tightly-packed Tokyo neighbourhoods always requires an up-to-date navigation system, and in this case the fitted unit doubles as a TV and DVD player which would surely appease Takashi’s children in traffic jams. 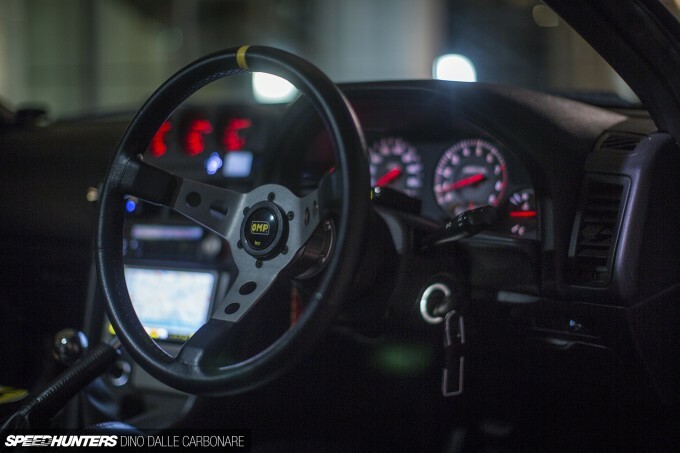 The ER34 didn’t come with the GT-R’s MFD screen with all the engine’s parameters on show, so Takashi did the next best thing and added an Blitz R-VIT which pretty much shows the exact same info coming from the ECU through a small backlit LCD screen. When Takashi hits the track the HREs come off and a set of spare wheels with more affordable rubber are fitted at the rear. Due to a lack of storage place they are usually kept on the back seat, safely tied down with the belts. 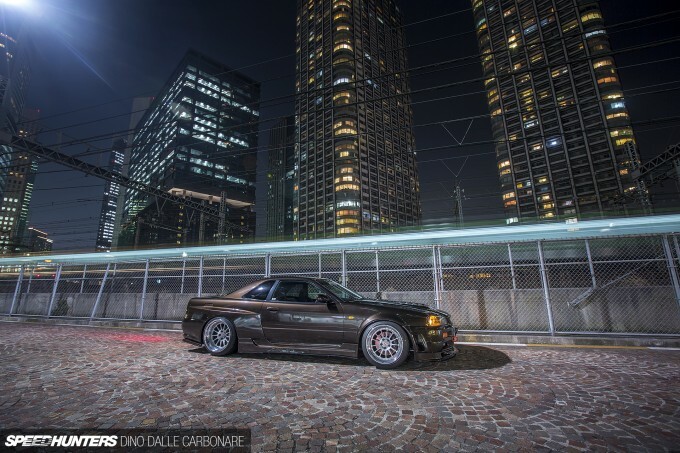 With a mix of well thought out touches and parts, Takashi has easily created one of the coolest san-yon Skylines that we have come across in Japan – a car that is quickly becoming a well-known creation thanks to the wonders of the internet. Takashi eh? Wasn't he in Tokio Drift? 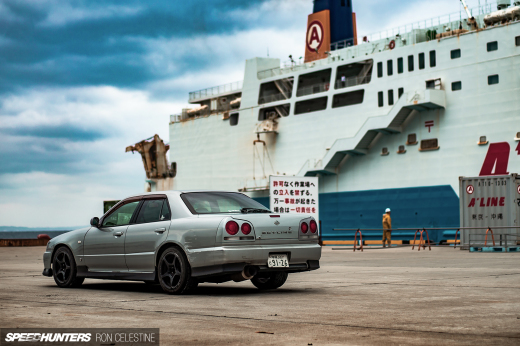 Wtvr, nice r34, we need more of them. Nicely done. Love everything about this build. 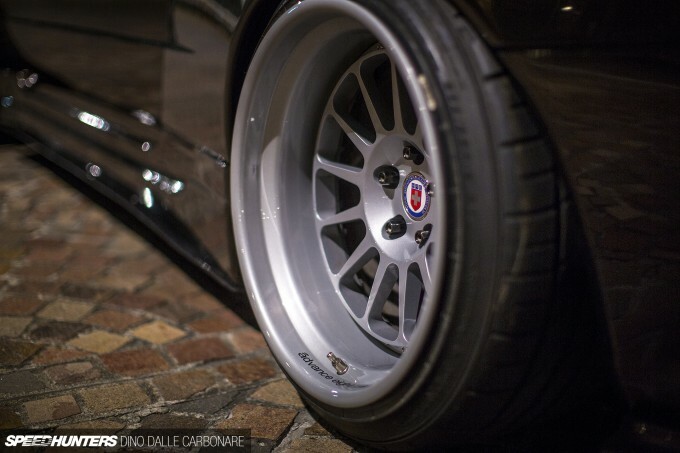 Wow never seen those wheels. They look good enough to justify the cost. Also, I'm jealous of the power. 2.5 sti with an 18g would never make that much power! It's not fair. That paint really is something else, if I wasn't already set on Lambo Thirty metallic, that Panamera brown would've won me over instantly. 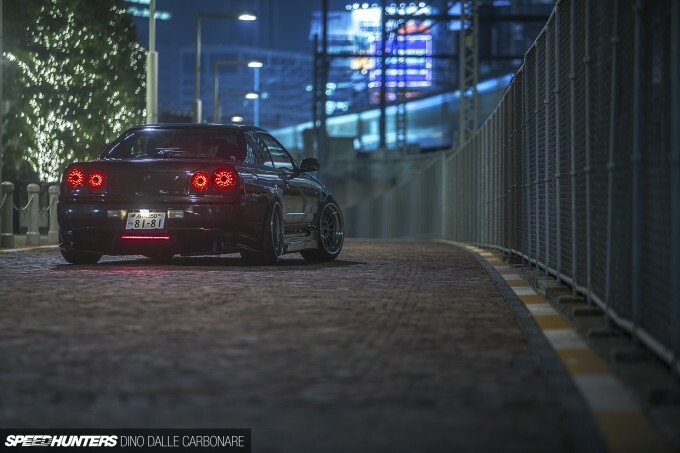 All in all this is a great article, love the night shots you do Dino. Any chance you could post the owners IG? Those wheels look fantastic on this car. Great choice by the owner. 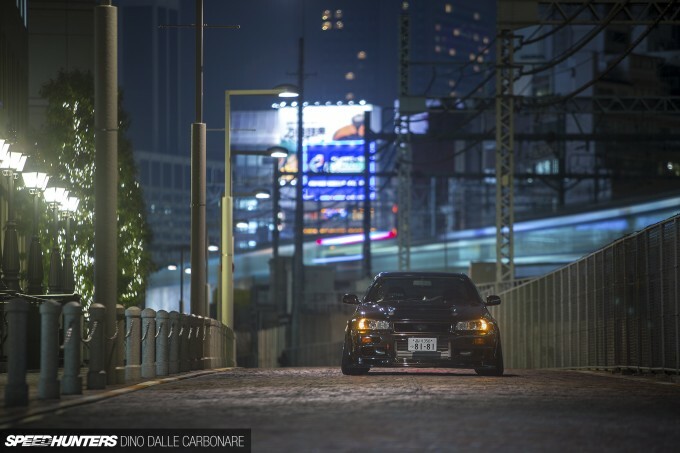 An R34 against the backdrop of nocturnal Tokyo? 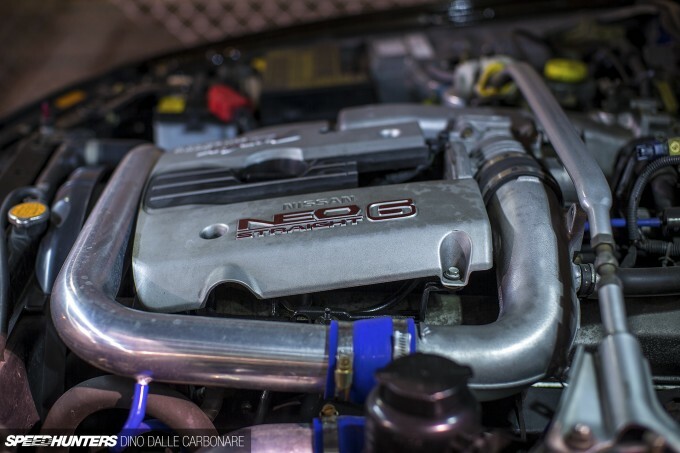 However, I agree with you wholeheartedly about that engine cover - makes the plant look like a V6. Let the straight-6 goodness shine! 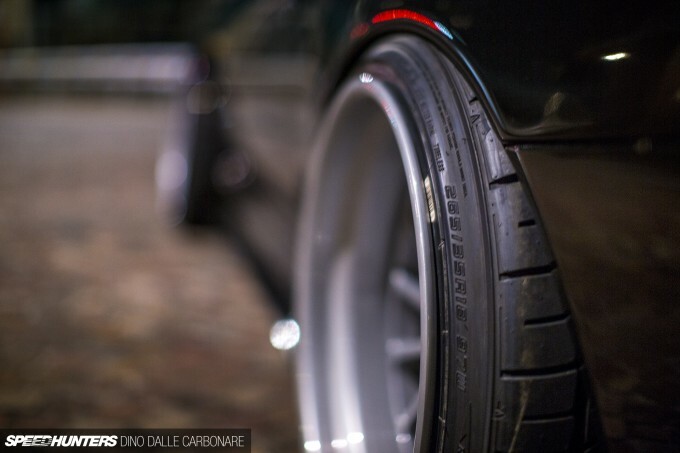 "245/40 rubber to get the look just right." Really? are you sure because the size is clearly visible in the picture and it says "265/35R18". Wow. A GT-t I actually like. In Japan they are not as popular as a GTR, but here in Sydney it's almost a daily sighting of modified GT-ts. And this one is juuuuuuust right. 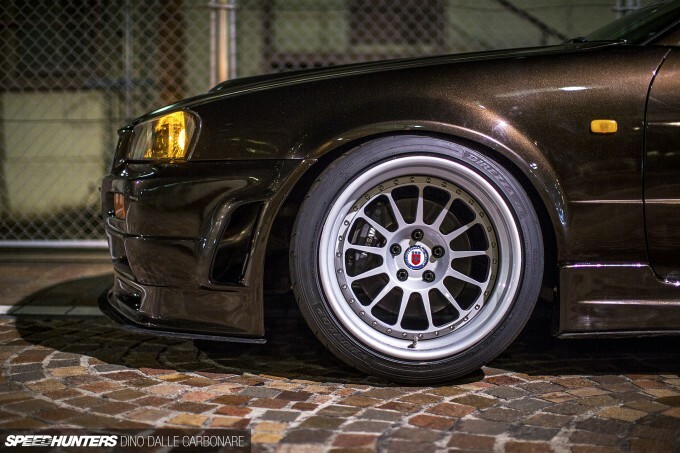 Love the post, the car, stance and that HRE wheel choice...but not the stretched rubber though. 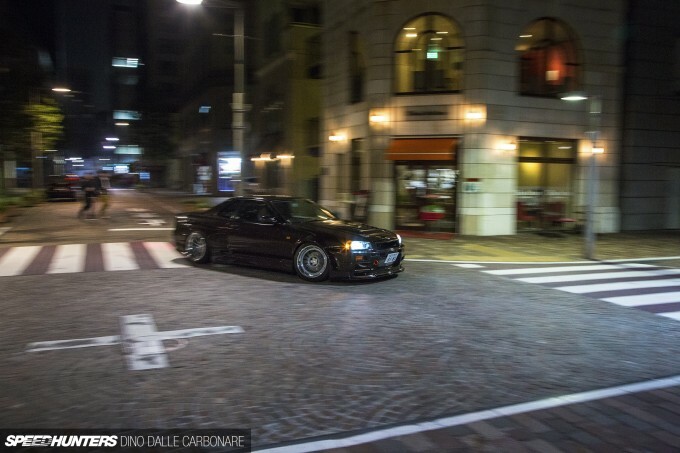 Rarely has a wing-less R34 look so good! This is one of those machines that look just right. THIS BUILD JUST SCREAMS EAT SH#T AND DIE!!! Seriously, anyone who wants to know how it's done ^^^ see above. That thing could break the internet. Gotta give credit where it's due: The photos are ALSO "top of the game". CLASS DISMISSED. Now, go get those zip-ties out of your bumper! @THE GRINCH I agree, freshest car I've shot in a while, right mix of performance and style. Preludacris Yeah, hard to disagree! @tom Work Emotion I think. Thanks! zemanski Oh there are more coming up, stay put! Takes 4 times as long as day shots but worth it right? (please read this comment aloud) I WANT GTR !!!!!!!!!!!!!! MOU89 that's not a gtr. super sweet. I love how it looks like an RC car in the first pic. Yeah we're suckers for Skylines! simon potter A very detailed one! Great shots and gorgeous car! I want to see more like this! I don't know about GTS/GT-T.. I mean, I can appreciate any car, but it just screams, I couldn't afford a GT-R.. there's no other reason to buy one... I couldn't afford a GT-R.. but I waited until I could. I'm really liking the photography from this article; not sure what makes it all click together. Also, nice to see a normal Skyline being showcased. Thommo GTS drifts and a GT-R doesn't? Different tools for different jobs really. for the one's that can't afford a GTR (me included) it would be a nice solution But if you invest all that money to make it look like this you have bought a real GTR already a long time ago....! Anyway.. Thumbs up for the build! Nice one! I love the polished lip / painted lip setup. Also love to see drift cars done up custom. Stop trying to make drift cars look like racecars. MadMike gets it. Success! Both the Build and the Shoot... thank you guys! This car is gorgeous. The shots are excellent. But the write up is a bit condescending in the many comparisons to a GTR. Enjoy the car for what it is. bluestreaksti That's the benefit of having a small store / bore 6 cyl vs a 4 cyl like in the STI. Having a cast iron block that can take boost also doesn't hurt! lachlan Are you saying that, all else being equal, longer piping will not result in more lag due to fact that their is more volume to pressurize? Looks Great.. Cant seem to find any details about "New Type" Or "Eurou" in the intermaweb through. @Troy y u no use google. that paintjob is so gorgeous. speedhunters_dino kphillips9936 But why? How is something with stretched tires going to be a 'drift' car? Or is this some new version of drifting where sidewall loads do not exist? 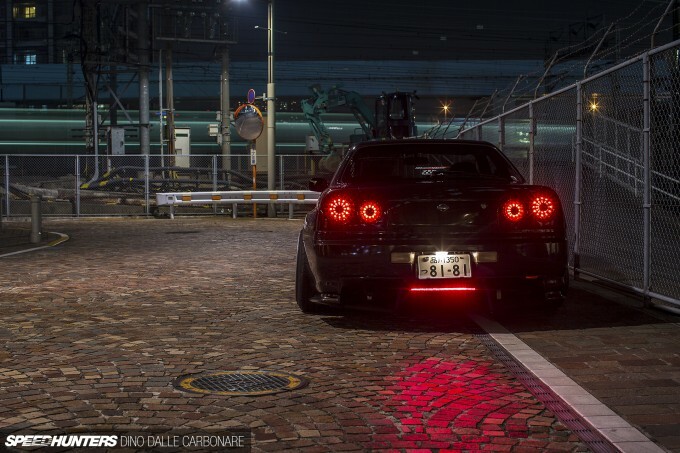 If you had someone widen the flares already, why not have them finish the job and make it so that the tires can have proper fitment? Everything makes sense until the tires. 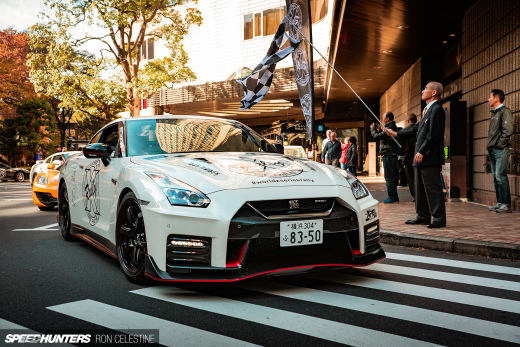 alexcheetah MOU89 I konw, BUT I WANT GTR !!!!!!!!!!! @turbo BEAMS ae86 Caspaa Thommo So then if you're planning on pulling the fuse in a GT-R anyway, why not lose the unnecessary unsprung weight of a front transaxle & axles? 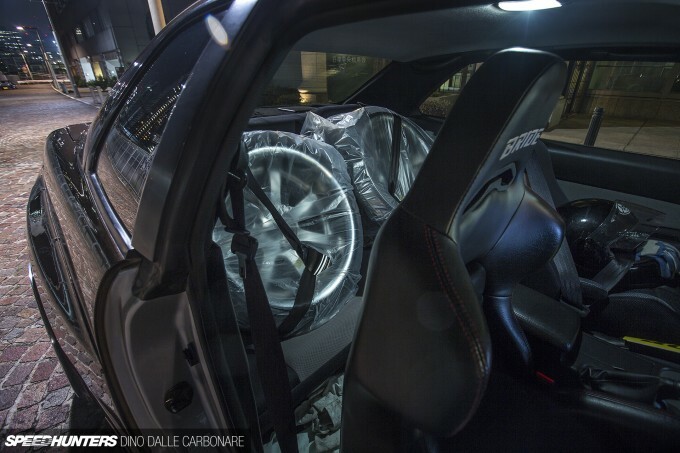 Why not go the cheaper route for the same gain, with more leftover for aftermarket parts? If you're not using the AWD, then don't hog the models equipped with it!! Derelict speedhunters_dino kphillips9936 You did see the extra set of rubber in the backseat, right? If he's going to the track, he'll swap them out for the appropriate setup! Might as well achieve the look he wanted since it's just as much a show car as it is being a drifter & daily!! 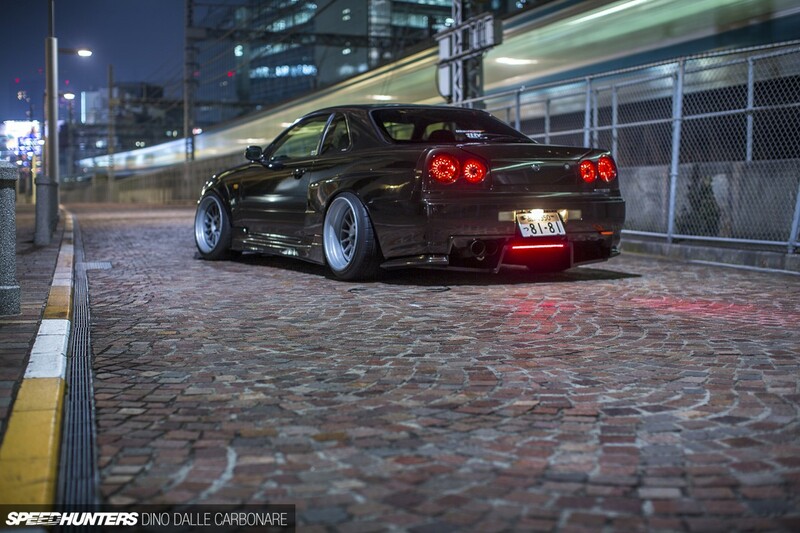 Best non gtr skyline i have seen!! !good job there! Some of the best articles you write are thanks to the locations as well - we stayed probably about 10 minutes from here in Tokyo and it brought back some good memories. Make sure you take pictures if you ever take a family trip to Kyoto - I'd love to see what kind of images you come back with! 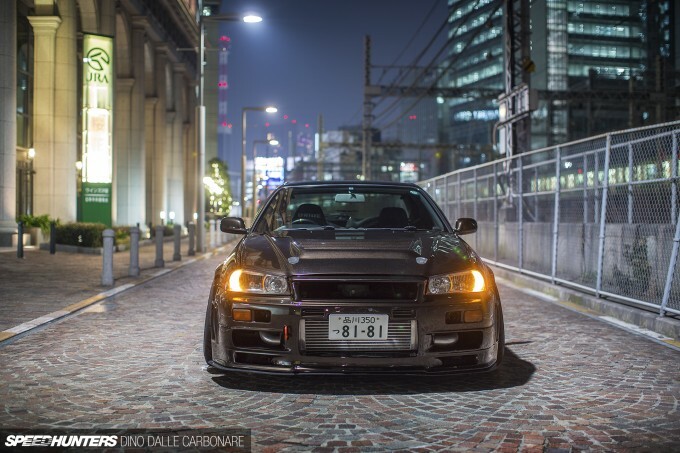 Nice R34, too. Thommo THis comment is so LOL. 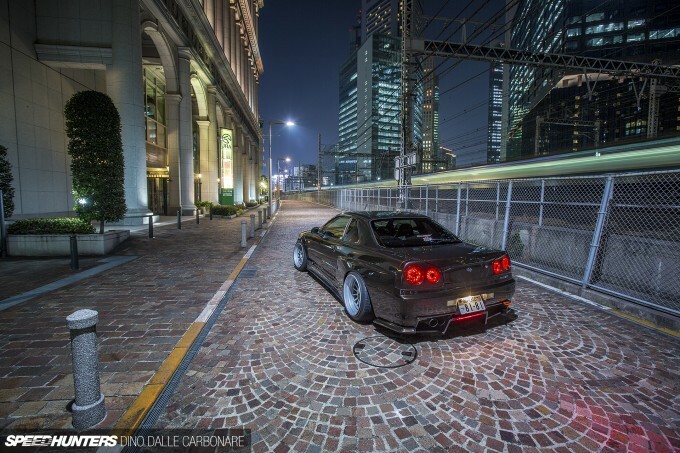 Not everyone wants a GTR, I don't care for them personally, I like FR.